Daniel 9 which contains the “Seventy Weeks” prophecy is no doubt one of the most significant and detailed prophetic passages in the Bible. It begins with Daniel praying for Israel, acknowledging they have sinned against God and asking for God’s forgiveness. 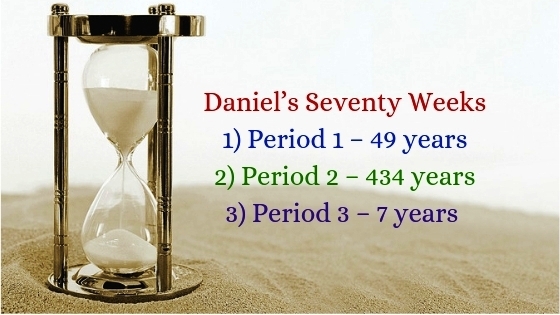 In answer to Daniel’s prayer, the angel Gabriel explained that during a period of “Seventy Weeks” or “seventy sets of seven” (Daniel 9:24), the Lord would accomplish six specific purposes for the Jewish people. The first three have to do with sin and the last three with righteousness. The Lord would “finish their rebellion,” that is, the transgression of the Jewish people, and “put an end to their sin” – Israel’s national sins (Zechariah 12:10–13:1). The last three divine purposes focus on righteousness and the future kingdom of the Messiah. When Jesus returns, He will establish His righteous kingdom (Jeremiah 23:5-6; 31:31-34) and rule in righteousness (Isaiah 4:2-6). All of these wonderful accomplishments would be fulfilled during seventy weeks – 490 years – that Gabriel divided into three significant periods: 49 years, 434 years and 7 years. During this period, the Jews would rebuild the city of Jerusalem in troubled times. The key issue here is the date of the decree. This is not the decree of Cyrus in 538 BC permitting the Jews to return to their land and rebuild their Temple (Ezra 1; Isaiah 44:28) because the emphasis of this decree is on the city of Jerusalem. While some scholars opt for the decree of Artaxerxes in 457 BC, sending Ezra to Jerusalem (Ezra 7:12-26), that decree also emphasized the Temple and its ministry. The decree of Daniel 9:25 is probably that of Artaxerxes in 445 BC authorizing Nehemiah to go to Jerusalem to rebuild the walls and restore the gates (Nehemiah 2:5-8). Gabriel affirmed that 483 years are involved from the giving of the decree to the coming of “the Anointed One,” the ruler (7 x 7 = 49, 7 x 62 = 434; total = 483). When we count 483 solar years from the year 445 BC, we end up with AD 29/30, which brings us to the time of Christ’s ministry on earth. This speaks of His rejection by the Jewish nation (Luke 13:33-35; John 1:11) and His crucifixion as a criminal, turned over to the Roman authorities by one of His own disciples. But He would die for the sins of the world, including the Jewish nation. That same nation that asked for Jesus to be crucified went on to persecute the church and kill Stephen (Acts 7). In AD 70, the prophecy in Daniel 9:26 was fulfilled when the Roman armies destroyed Jerusalem and the Temple, and the Jewish nation was scattered. The Romans are the “prince” (or ruler) who will arise and “whose armies will destroy the city and the Temple,” and that prince is the future Antichrist that Daniel described as the “small horn” and the blasphemous king (Daniel 7:8, 24-25; 8:23-27). This takes us to the third period. While the Lord has always known wars and desolation (Matthew 24:3-24), the end of the age will introduce a time of terrible suffering that will climax with the return of Jesus Christ (Revelation 6 – 19; Matthew 24:15-35). The event that triggers this last seven-year period will be the signing of a covenant between the Antichrist and the Jewish nation. At this time, the Antichrist will be a key political figure in Europe – one of the ten toes of the image in Daniel 2, and the “little horn” who emerges from the ten horns (Daniel 7:8, 24-25) and he will have the authority and ability to end the Middle East problem. He will covenant to protect the Jews from their enemies, probably so they can build their Temple and restore their sacrifices. The spiritually blind Jewish leaders, ignorant of their own Scriptures, will gladly enter into the covenant. “For I have come to you in My Father’s name, and you have rejected Me,” Jesus told the Jewish leaders of His day; “Yet if others come in their own name, you gladly welcome them” (John 5:43). After three and a half years, the Antichrist will break the covenant, seize the Temple, and put his own image there, and he will force the world to worship him (2 Thessalonians 2; Revelation 13). This is the “abomination that causes desolation” (Daniel 11:31; 12:11) about which Jesus spoke and that marks the midpoint of the tribulation period (Matthew 24:15; Mark 13:14). The “man of lawlessness” and “the one who brings destruction” (2 Thessalonians 2:3), who up till now has deceived the world by playing a shrewd political game, will reveal himself as a tool of Satan and a cruel world dictator, Christ will defeat him when He returns to establish His kingdom (Revelation 19:11-21). We are living today in the church age when Israel has been partially blinded and temporarily set aside (Romans 9–11). Like Paul, we must have a heart concern for the Jewish people, pray for them, and seek to share the Gospel with them. Gentile believers have a debt to the people of Israel (Romans 15:24-27) because they gave us the knowledge of the true and living God, the inspired written Scriptures, and the Savior, Jesus Christ. Perhaps no Old Testament book is as far-reaching in envisioning historical events as the Book of Daniel. In this revised edition of his classic work on pre-millennial prophecy, Walvoord addresses alleged historical inaccuracies, considers past and future fulfillments of specific prophecies, explores different approaches to interpretation, and examines textual and doctrinal issues. *Learn to create your own website for free by joining me in a wonderful community that teaches you everything you need to know about web design and affiliate marketing. What is the “covenant”, and is the whole “week” the Tribulation, or just the last half of the week? The signing of a seven-year covenant between the Antichrist and the nation of Israel will mark the beginning of the Tribulation which is the last 7 years in God’s prophetic time clock. But what is the covenant? We know from Scriptures that the Jews are still waiting for a Messiah who will bring peace to the Middle East. It is also said that one of the provision of that covenant might permit the Jews to rebuild their Temple. The Temple must be rebuilt in Jerusalem because we read in Revelation that there will be a Temple where the unbelieving Jews will once again resume their sacrifices. And to answer your second question, yes, the concluding week of years (seven years) corresponds to the Tribulation. Again, as Daniel 9:27 says, the tribulation begins with the signing of a peace treaty between the Antichrist and Israel, intended to be for one “seven,” that is, a set of seven years. But the “seven” is divided into halves: midway through the seven years, the Antichrist breaks the treaty and sets up in the temple a sacrilegious object (the “abomination that causes desolation”). The phrase “in the middle” indicates that the first half of the tribulation lasts for 3½ years (1,260 days, using a “prophetic year” of 360 days). Likewise, the second half of the tribulation, known as the ‘Great Tribulation” lasts another 1,260 days (another 3½ years), for a total of seven years. It is important to emphasize that the “Great Tribulation” and the “Tribulation” are not synonymous terms. Within eschatology, the Tribulation refers to the full seven-year period while the “Great Tribulation” refers to the second half of the Tribulation.